With over 350 million users (and rising fast) on Facebook, the social media platform has become nearly the #1 bullseye for spammers. And what’s the easiest way into the profile settings of your Facebook account? Through applications! You can a notification that one of your friends has commented on one of your photos. And as amazing as it is – the app will actually use one of your real friend’s name. And then, you’ll look at it and go hmmm… I wonder what Joe or Mary had to say about my photo. And when you click on the notification, you’ll be taken to a Photo Comments App that needs to be installed into your Facebook profile. The Comment Photo App is just the beginning of a new phase in spam marketing. 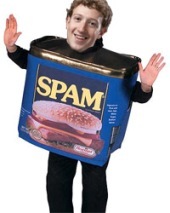 The spammers – who are also the marketers – are staring at Facebook like a savaged beast that is on the verge of starvation. I guess I’m writing this to let you, the readers of my blog, to know that you have to be aware of spam on Facebook. If not, then your entire profile, along with all of your information, can be compromised and exploited. More than likely the worse that would happen is that you’d start receiving unwanted marketing material in your Facebook inbox or news stream. Don’t install an application into your Facebook profile that you don’t fully understand. And before you do install the application, make sure you visit the application’s page and read what other people are saying about in the discussions tab, and on their wall. These are just some of the ways you can prevent the spammers on Facebook from compromising your Facebook profile. What are some other ways you found that spammers are infiltrating your Facebook profile of Facebook Fan Page?